FORTITUDE: Episode One Review | Warped Factor - Words in the Key of Geek. Tony Fyler says welcome to The Twin Lost Peaks Killing. On Ice. Fortitude, the new ‘must-see’ drama from Sky Atlantic is a big gamble. It’s staking the biggest budget known to man for a series of its kind – close to £30m - on a combination of beautiful scenery, big name stars and, if the evidence of the first feature-length episode is anything to go by, a combination of the scattergun-reference strategy from Lost, the ‘close community’ creepiness of Twin Peaks, and the genuinely oppressive miserableness of Nordic noir like The Killing. Ah, but does it work? So what’s the score with Fortitude? Fortitude’s a town on the island of Svalbard, inside the Arctic Circle. That means snow, ice, more contextually believable polar bears than Lost, isolation, and months of oppressive darkness from which the town has just conveniently emerged when the story starts. Immediately then, you have a base-under-siege potential, and the fact that the town has just 7,000 residents, each of whom if you believe the town’s own hype has a job to do, meaning there’s no crime, gives the place both a gated community feel, and in the same breath, the potential for a mob mentality that brings Shirley Jackson’s The Lottery uncomfortably to mind. You can probably get away with many things in a town like this if you can get enough people to collude with you. From the outset, there’s a sense that several someones are getting away with several somethings in Fortitude. The local mine is frankly mined out, meaning there’s a pressing need for the town’s Governor Odegard (played by Sofie Gråbøl – yes, her from The Killing) to get the go-ahead for a new tourist hotel to keep the town alive. 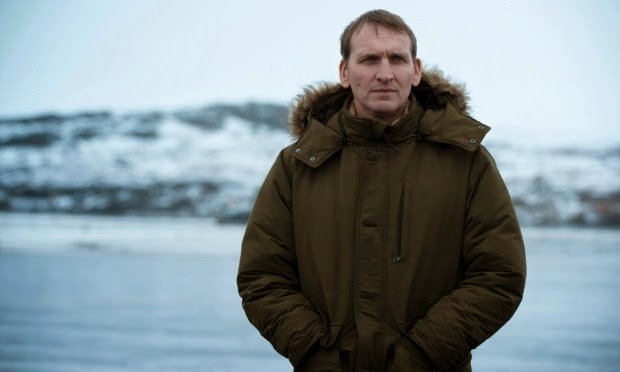 There’s a Professor in town, doing a survey to ensure that the development can go ahead with no ecological consequences to the local glacier (That would be your actual Christopher Eccleston, giving, perhaps bizarrely, one of the rare smiles in the whole first episode). There are miners making epoch-making scientific discoveries and then attempting to charge for them, pushing Eccleston’s Professor Stoddart to investigate the potential of getting them arrested so he can essentially nick their find. If what they’ve found is what they think they’ve found, that also puts Stoddart in opposition to Odegard – which given that she’s the governor and has, it seems, her own tame alcoholic police chief with a nasty habit of turning up at crime scenes either before or immediately after they become crime scenes (played with the only notable glee in the piece by Richard ‘Game of Thrones’ Dorner), is probably not a terribly tenable place to be. There’s an ex-army search and rescue guy having a seemingly joyless grunting affair with a woman whose sole function so far is to deliver oblique one-liners, drink in bars and maybe just possibly work in a hotel. Search and rescue guy Frank is married to Jules (Call The Midwife’s Jessica Raine), and their son may have mumps…or, just conceivably, polio. Because…well, why not? The lad also ends up with something else fairly gruesome in the opening episode and has to be carted off to a research centre conveniently located on the island, where potentially weird things are happening (weird research centre…island…seriously, someone get JJ Abrams on the phone). There’s an old man named Henry Tyson (played by Michael Gambon here, very much more in Singing Detective mode than anything akin to Dumbledore), whose function in Fortitude (everyone has one, remember?) appears to be mainly to die of liver cancer and not be able to shoot polar bears. Plus, flying in to make life more complicated for everyone, there’s DCI Morton, an American detective from London, who, it’s rather heavy-handedly pointed out just in case you missed it, would have to have got on a plane to help investigate the goings on in episode one, before any of the goings on had actually gone on (but he’s played by Stanley Tucci, so who cares, eh? ), and Professor Stoddart’s wife, played by Chippo ‘Chantho’ Chung. As a game of geek bingo, Fortitude episode one is simply superb – you get double bonus points if you spot Lucy Saxon in the mix – but as drama, it’s all a rather pretty, but moodily dismal affair. As we’ve said, this is absolutely no barrier to barnstorming worldwide success, and Fortitude may well become the next great must-discuss drama. Certainly there are plenty of questions to ponder: Is the miners’ discovery of any significance at all, or is it the key to the whole thing? ; What had Stoddart discovered before the miners went tripping over invaluable scientific finds? What’s going on with the weirdness at the research centre? Is DCI Morton even who he claims to be, and if so, how did he know he’d be needed before he was needed? Is the town suffering from the beginnings of some toxic episode? Why is Henry Tyson here at all, let alone having rancorous disagreements with Anderssen, the tame alcoholic police chief – and many, many more, without of course even touching on the main questions raised in what would be a hugely spoilerific fashion by the first episode. Whether Fortitude deserves to be the next great must-discuss drama is an entirely different question. There’s a sense of somewhat stale button-pushing here from writer Simon Donald, a sense of taking the greatest ingredients of off-beat TV drama over the last couple of decades – a pinch of Twin Peaks’ claustrophobia here, a bushel of random pseudo-clues and phrases a la Lost there, marinade in the miserablism of The Killing for a long eleven episodes - and serving them over a heck of a lot of ice to refresh them as much as possible. Whether the mainstream audience the show is aiming for (and which, given its budget, it has no option but to aim for) will still swallow it actually depends very little on the quality of the work. It depends more on whether Sky Atlantic has judged its moment well – riding the crest of shows like The Killing, Broadchurch, True Detective and The Following – or whether in fact Fortitude has arrived one or two shows too late to the party. As we said at the start, whether it works or not rather depends on how much time you have spare to watch people be baffled and miserable all at once; on whether there’s room in the mainstream audience’s attention span and Sky Plus box for one more dark, gritty excoriation of the human soul before the trend simply snaps in two and dissolves. Watch this space to find out.